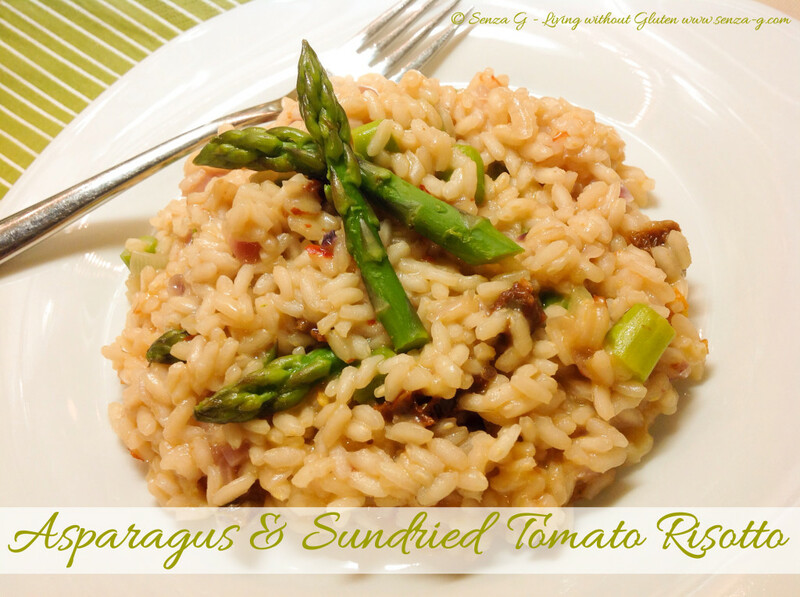 A perfect risotto for spring! Delicious and healthy asparagus spears with a nice punch of a sweet-tart tomato flavour! * I used the dry-packed ones, which are not that salty. You can also use the ones packed in oil. Drain before using. Bring the gluten free vegetable stock to a boil and then lower the heat and let it simmer. Wash the asparagus, cut off the tough bottom ends and chop the rest into 2cm chunks. Reserve the tips. Chop the sun dried tomatoes roughly. In a pot, sauté the onions in a little olive oil until translucent. Add the garlic and cook for a few minutes but do not let it brown. Add the rice and cook until lightly toasted. Pour in the wine and when it is nearly absorbed, start adding the stock ladle by ladle whilst continuing to stir the rice. Halfway through the cooking, add the chopped asparagus and stir, to combine with the rice. Add the thyme sprig and the chilli if using. Do not let the rice go dry. Towards the end of cooking time, add also the asparagus tips and the chopped sun dried tomatoes. When the rice feels ready, remove the thyme sprig, add the Parmesan cheese, a knob of butter and check for seasoning. A risotto should not be dry, but saucy in texture. Add a little stock if necessary. Stir in the chopped parsley. Cover the pot and leave for a couple minutes before serving. Serve garnished with a couple asparagus tips.